Do you dream of taking your loved ones on a Disney vacation but can't figure out how you will afford the ever growing price tag? Do you want to leave the grocery store without feeling stressed and overwhelmed at the price you just paid? Do you want to learn how to save money on everything your family needs and how to use the money you saved to pay for something your family wants? I believe that everyone deserves the opportunity to make magical memories with their loved ones without going into debt to do it. Did you know you can pay cash for your Disney vacation in approximately 12-18 months by putting your family on a budget and saving and earning money via creative methods?!?! The best part is, you won’t have to set aside specific amounts from your paycheck to do it! Regardless of your financial situation, saving for your dreams is within your reach. Kristin's Saving For Disney Course is a MUST have for anyone struggling with a budget and/or saving for vacation. I have finally been able to get our household into an actual budget! Kristin takes a the scary ideas of budgeting and couponing and transforms them into a simple no-fuss approach. Savings For Disney will teach you how to budget your money, organize your coupons, manage your stockpile, earn extra income and save on practically every expense you have. Watch your savings grow and your debt shrink while simultaneously saving for your dream family vacation. Best of all, you'll be able to create more memories with your loved ones that you will cherish for the rest of your life. Learn how to budget your way to Disney. This E-Book includes budgeting tips and printable worksheets to keep you on track. Learn how to coupon your way to Disney with this all-inclusive Couponing How-to E-Book. Take couponing a step further with this Couponing Binder E-Book. It's filled with secret shopping tips to help save for Disney. This E-book is geared towards all levels of couponers. Learn how to cut back on everyday expenses including entertainment, auto, and grocery shopping. Grow your Disney fund by earning extra income from home. This ebook will highlight cash back programs, Rewards programs, selling unwanted household items and more. 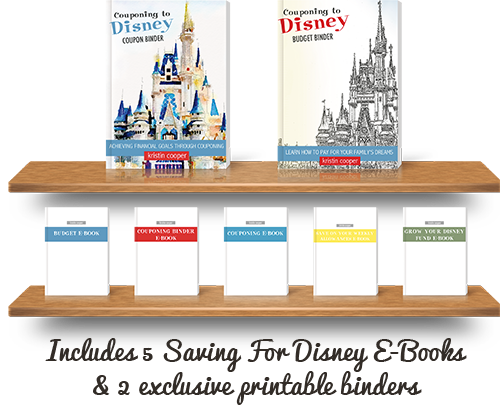 When you purchase the Saving For Disney E-Book Collection, you'll gain instant access to the 5 E-Books highlighted above as well as 2 printable binders. 32-Page Printable PDF to help you track your spending and savings. 33-Page Printable PDF to help organize your coupons, shopping lists, and stockpile. 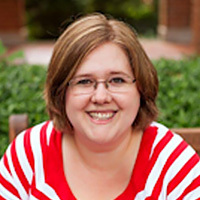 Many people have used the techniques featured in the Saving for Disney E-Books to save for their dream Disney vacation. See what readers have to say! I came here looking to save for Disney and left with a whole lot more. This collection of books is something you can refer back to over and over again. I was thrilled to read many new ideas on how to save money that I have not seen anywhere else. I can not wait to get started on the worksheets! This is going to benefit my family and me beyond just saving for Disney (although that is fun too!). The binders have so many great printouts to help you get a budget going and get set couponing as well. The ebooks are jammed packed full of so much useful information and ideas that anyone can get started at saving for their Disney Dream! Amazing! The step by step e-books and the complete worksheets for the binders make this the easiest to use and most comprehensive budgeting AND couponing system I've seen. I couldn't wait to get started on my journey to healthier finances and my first stop is definitely Kristin's Budget Binder. She has such an amazing way of making this journey not only easy to understand and easy to implement, but exciting as well. I love it. I think it will help those that are trying to eliminate debt to stay focused on their goals and to see the progress they have made. Kristin shows you how every family can pay for a Disney vacation in cash. Regardless of your financial situation, saving for your dreams is within your reach. This course breaks it down, step by step, so even the beginner saver can have huge results! I have always couponed, but I have always been a simple couponer. If I happen to have a coupon, great! If it matches with a sale then even better. After reading Kristin's couponing E-Book I realized there is so much more I could be doing to save money via couponing and that I could do it without cutting into my schedule. I learned I can easily involove my family as we build our Couponing Binder! I have been using your budget binder (the free version) for over a year and I thought it was the bees knees. I then purchased the paid version, which is a steal. You get 5, yes, you are reading that right, FIVE E-books, a couponing binder, and a budget binder all for just $29.95! That comes out to only $4.27 per book or binder! The Budget Binder answers all your “what if” and “where is (fill-in-the-blank)” and the “what is this money earmarked for” questions that we all get when we do not keep formal written budgets and records. Included in the budget binder is a savings breakdown sheet. I love this because it streamlined my efforts. I used to have at least 8 spreadsheets to keep track of everything I was saving for in my savings account! One is much easier to manage, and it is so easy to follow! There is also an “Upcoming Expense” worksheet that helps you track any upcoming expense you may have. For example, those bills, like property taxes, that only come quarterly or yearly. No more being surprised and panicked when these expenses arrive! There is even a section for Christmas that covers everything from food to gifts and helps you break down how much you need to save from every check to be 100% fully funded at Christmas time! When I first heard of the budget binder I thought “Well this sounds nice but its so much ink and paper to waste.” I was really hesitant to purchase the system just because of the ink cost to print out the binders. After a few days of thinking about it I went ahead and purchased the system. While filling out the budget binder I had to reprint a few sheets more than once because of my errors in filling out the worksheets. I am a bit of a neat freak. While I was reprinting the worksheets it dawned on me I would not be able to reprint these if this had been an actual hard-copy book! That is the beauty in the worksheets! You can reprint as many times as you want to make your budget binder the perfect for you! I have definitely saved far more than I invested into this system and I am so glad I opted to give it a try! Kristin's Couponing to Disney Course is a MUST have for anyone struggling with a budget and/or saving for vacation. It is so detailed, and she walks you through everything step-by-step. I didn't have a clue where to start when first trying to come up with a budget, but after reading through all the included e-books, I knew exactly what to do. It really was a lifesaver! My name is Kristin Cooper and I am a coupon addict. My coupon addiction feeds my other addiction; Disney. How are the two related you ask? Well, I have learned how to use the money I save from couponing to pay for my yearly trips to Walt Disney World®. Following the methods outlined in this course, I have successfully paid for 4 trips to Walt Disney World and 1 cruise on the Disney Dream. I am also well on my way to paying for a 6th trip by couponing my way to Disney. I started CouponingtoDisney.com in June of 2009. Through the blog, I have been able to teach others how to budget their money, save on their grocery bill and how to maximize their time at Walt Disney World. Because of the sheer amount of information that I want to share with the world, I decided to put everything that I know into an easy to follow course on Saving for Disney. Start saving today for your dream Disney vacation with the Savings For Disney eBook. Have a question for Kristin? Submit the contact form below. Follow Kristin Cooper and Keep Up to Date on All Things Disney. © 2017 Couponing to Disney. All Rights Reserved.